The Kenan Fellows Program, established in 2000, is a K-12 STEM initiative of the Kenan Institute for Engineering, Technology & Science at NC State University. The program forges partnerships between K-12 schools, industry, research, and higher education to introduce students to the wonders of STEM. 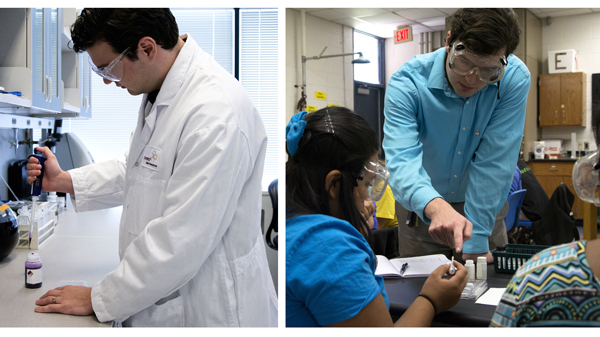 Kenan Fellows partner with mentors in STEM fields to learn how their work can be made relevant to students. Mentors come from academic and business fields including scientific research, engineering, agriculture, biotechnology, health care, aviation, communications, technology, and more. A core goal of the program is to develop teacher leaders who can drive innovation in their schools and districts. The five-week internship is the centerpiece of the yearlong program and is supported by 80 hours of professional development. Opportunities to meet with statewide leaders from industry, government, education, and business help Fellows gain experience in becoming effective advocates for education. Today, an elite network of more than 300 Kenan Fellows work to improve STEM education in North Carolina and beyond. The program is open to K-12 public and charter school teachers in North Carolina. Fellows are selected following a competitive application and interview process. A new cohort is announced each spring. Educators chosen as Kenan Fellows demonstrate proven leadership or leadership potential. The fellowships are made possible through the support of corporate, education, and foundation partnerships, as well as federal grants from agencies such as the National Science Foundation. Learn more at kenanfellows.org.